Nanango’s drive to build an inclusive playground at Butter Factory Park took another big leap forward on Friday night. The Nanango RSL Sub-Branch presented a cheque for $2500 to the Nanango Tourism and Development Association (NaTDA) towards the project. NaTDA have been acting as a central collection point for the community’s fundraising efforts ever since the plan to build a playground for disabled children and adults was announced. Last November, Heritage Nanango Community Funding said they would support the $80,000 project by matching all community fundraising efforts on a $3-for-$1 basis, up to a maximum of $60,000 over a 12-month fundraising window. NaTDA are banking donations for the project in a special account at Heritage. The Sub-Branch’s cheque was accepted by NaTDA representative Jane Erkens in front of a crowd attending the RSL’s Chinese New Year cuisine night. Jane said community fundraising efforts over the past four months had raised $6300 towards the $20,000 target, and the sub-branch’s contribution had now increased that to $8800. She said the park would not only be an asset to Nanango’s children, but to children from across the South Burnett. She thanked the Sub-Branch for their support. 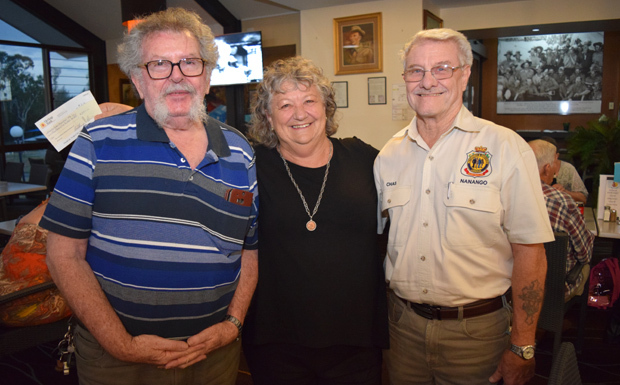 “Well, let’s see if we can do just a bit better,” RSL Club president Chas Kemp said, saying the club would be passing around a donation bucket to see if it could raise a little bit more from the night’s guests. In less than 10 minutes this collection – and the proceeds of a separate fundraising effort by the RSL’s Auxiliary – added a further $207 to the total. NaTDA president Gloria Kirkness said she was very pleased to accept the funds on the project’s behalf. “This gets us to roughly 45 per cent of where we want to be,” she said. Gloria said when it came to good causes she believed Nanango was one of the most generous towns in Queensland. She said NaTDA was quietly confident the balance would be raised before the cut-off date.